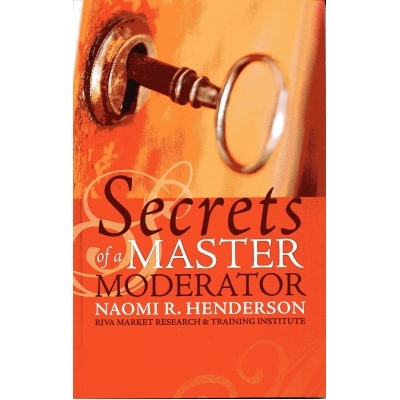 "Secrets of a Master Moderator by Naomi Henderson"
Naomi Henderson completed her first research project at age 14 and received her first paycheck as a research analyst at age 20. She has always been curious about the motivations behind the actions of individuals and groups. To date she has led over 6,000 focus grooups and personally interviewed over 50,000 respondents in either groups or one-on-one sessions. Ms. Henderson founded RIVA in 1981. The Institute is considered the "Gold Standard" for Moderator Training and Qualitative Research services. RIVA's Master Moderator(TM) Certificate Program is the first of its kind to be offered in the United States. All of the ideas and methodologies presented in this book have been tested and implemented in research projects, reports, class sessions, client meetings and presentations over the past thirty years. The author makes no claim that her way is "the way," rather she states boldly: "This is what has worked for me and I'm happy to pass on what I have learned."